A lot of updates have been going on WhatsApp and we are still expecting more features. The last features that was released is the ability to Send Any Type Of File Using Whatsapp and it currently enables users to share a maximum file size of 100MB (Android), 128MB (iOS) or 64MB (desktop). WhatsApp, it will open straight on Youtube apps… but now, it’s over. 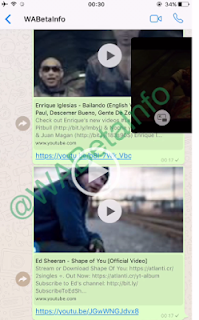 Finally this won’t happen anymore: this new feature implemented in WhatsApp uses the Picture in Picture concept to view YouTube videos without opening it. Though this feature is still under development but it is available for iOS users… Android users coming soon!